Damage to the inner part of the tooth’s structure will need more advanced dentistry procedures, to ensure that the tooth can be treated in the most effective way; the advanced procedures are done also to make sure that the tooth is saved from ultimately the last course of action in dentistry – tooth extraction. A root canal treatment by the dentist at Woodbury Dental and Laser Clinic a will effectively save the affected tooth from being extracted, so that its form and function can still be enjoyed by the patient. A root canal treatment is a dental treatment procedure used t repair the damage to the tooth’s pulp and root areas, which may be caused by tooth decay. The dentist at Woodbury Dental and Laser Clinic will do a root canal treatment in order to save the affected tooth from being lost completely through tooth extraction. Also called endodontics, the root canal treatment involves the removal of the infected pulp portion of the tooth; this treatment also includes the cleaning, treatment, and sealing of the tooth’s root to prevent the infection from spreading and doing even more damage. Root canal treatment is necessary in treating an infection involving the tooth’s pulp and root parts. Once the infection has reached the pulp and the tooth root/s, it will not be treated effectively with the help of antibiotics alone; a root canal treatment is needed to remove the infected parts, and to prevent the infection from worsening or spreading to other parts of the dental cavity.Root canal therapy will need to be carried out by the dentist at Woodbury Dental and Laser Clinic to remove the damaged part of the tooth pulp, so that the affected tooth can be prepared for the restoration that it needs (after the damage and infection has been treated successfully). Even before the actual root canal treatment can be performed, X-rays or CT scans may be taken to provide a clearer image of the position and shape of the roots to be treated. The x-rays or CT scan images will also help the dentist at Woodbury Dental and Laser Clinic in determining if the surrounding bone structure has been affected by infection. 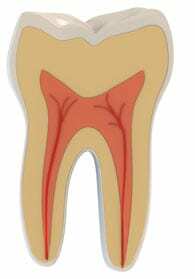 Once the tooth’s root image has been taken, the dentist will be able to formulate a root canal treatment plan to address the patient’s specific needs. The actual root canal treatment will start by administering a local anaesthesia on the area where the treatment will be done. The local anaesthesia may not be needed in cases when the root or roots of the tooth are “dead” (and will not feel anything from the procedure); however, the numbing properties are needed to ensure that the patient will not be exposed to any kind of discomfort throughout the entire procedure. A sheet of rubber will be used by the dentist at Woodbury Dental and Laser Clinic to cover the area surrounding the tooth to be treated, to ensure that the tooth is kept free dry and saliva-free throughout the root canal treatment procedure. A hole will be drilled into the tooth, to gain access to the damaged or infected pulp. The pulp area that has been damaged will be removed to prevent infection from spreading to the other parts of the tooth. After the infected pulp has been removed, the dentist at Woodbury Dental and Laser Clinic will need to measure the root canals to ensure that the entire length of the affected canal (or canals) will successfully be cleaned and filled. Measuring the canals will also give the dentist an idea on the amount of filling material that needs to be used. The interior part of the root canals will be scraped clean of any infected or diseased parts, to prevent the infection from spreading or doing any more damage. The affected canal or canals will then be cleaned with antiseptic to ensure complete cleanliness, in preparation for the root canal filling. The root canal will then be filled with the filling material, and then sealed. In cases when an infection is present – the dentist at Woodbury Dental and Laser Clinic may put a temporary filling inside the root canals to ensure that no food particles or other debris can go inside, while waiting for the infection to subside and before the permanent filling can be placed inside the root canals. Another appointment with the dentist will involve the placement of a rubber compound called gutta percha into the root canal. The hole that was drilled to gain access to the root canals will be filled with dental filling to restore the tooth’s form and function. In cases when the damage to the pulp has been extensive, it may be necessary to use a tooth restoration such as a dental crown – so that the tooth may still be saved, and can still appear and function just like other normal teeth.